This is out of the ordinary from what we usually discover, but since we’re open minded here at Nanobot, I was excited to give it a whirl. Spokane gospel vocalist Kenny Andrews began singing at just four years old. His passion for music has settled firmly around gospel and his community. Though he has performed the National Anthem for Gonzaga University’s Basketball and contributed his voice to Radio and TV ads on Boston Legal, Bernie Mac and Scrubs he keeps his feet planted in delivering his sound through the song of praise. When New Creature came to me, I’ll be honest; I immediately got the impression I was getting some Gregorian –like, organ filled monotone bore-fest. Hey, if I weren’t honest, you wouldn’t understand the impact of what I’m about to say. New Creature is not your parent’s worship album. It is not some bland, boring rendition of the hymns that have been drilled into the minds of church-going folk for decades. Though it begins with a very orchestral and deceptive sound with “Entrance of the King,” the album quickly expands into itself. Andrews adds funk, vocal diversity, beautiful background singers and range to his sound to craft something unique. It is still jammed packed with pure Christian references, as should be expected. But Andrews takes a new direction and it works well. Varying from upbeat funk (“He Reigns”) to the mellow R&B (“He Loves Me” and “So Amazing”) New Creature doesn’t bore. The record delivers on a new-face and gives opportunity to deepen a genre that, let’s face it, could use some new ideas. 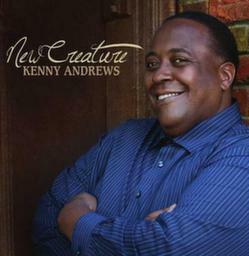 Kenny Andrews opened my eyes to a new outlook on Christian music. In the past, DC Talk and News Boys have been revolutionary sounds for those looking for alternative worship, but even then they were seemingly meant for younger audiences. Andrews offers a refreshing sound for that bridge between the youthful praise and the comatose Sunday pews. This entry was posted in Reviews and tagged Christian, Gospel, Kenny Andrews, music, nanobot, New Creature, review, Spokane by Greg. Bookmark the permalink.